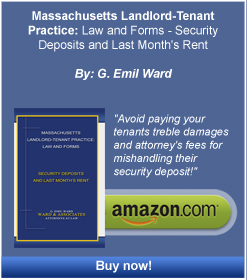 Residential Sales - Boston Real Estate Attorney. Eviction Law. Zoning and Variances. Housing Discrimination. There is no doubt by now that anyone interested in buying real estate has heard that old saying: “Buying a home will be the largest and most important investment you will ever make.” This is just as true today as when the saying first came into vogue. That is why we offer help with real estate purchases and sales. Ward & Associates has been helping people buy and sell real estate for almost four decades. This includes residential rental property, single-family homes, and commercial property. Due to several factors, we no longer represent residential buyers, unless it is a cash transaction, with no financing. However, we would be happy to make a referral to another attorney for that work. Crafting the language of inspection contingencies or special provisions, for example, provisions which allow for the sellers to remain on the property a short time after closing, or which allow the buyers to negotiate the inclusion of certain repairs in the purchase price, are tasks best left to an attorney dedicated to protecting the interests of the parties. Additionally, some of these tasks also come up BEFORE the lender’s attorney enters the picture. For professional buyers and sellers, or for those who cannot be present at closing, we obtain the numbers of the transaction beforehand. We prepare the appropriate documents, have them executed overseas and conduct the closings with the appropriate authorizations, in the absence of some sellers, all according to Massachusetts conveyancing standards. We have conducted closings for the various parties where the buyers or sellers were in China or Switzerland, for example. Even greater protections are offered by our firm to buyers and sellers of commercial property in that the dollar values involved usually far exceed the size of the average residential transaction and often more issues are raised at the offer stage where we have a chance to have more input in the transaction. In commercial purchases we can often insert flood insurance, E-21, tenancy review, and tenant history and financial review contingencies to fully protect buyers and sellers at this critical early stage. Our firm does its due diligence for the buying or selling LLC, or other business entity. We monitor E-21 issues. We check title issues and we make certain that a seller or buyer receives nothing less than what the signed contract calls for at the end of the day. Please contact us to discuss the services we can provide to you in the purchase or sale of real estate in Massachusetts and our fees for doing so. Let us put our in-depth experience to work for you solving your legal problems.